This shield is an electrotype replica made in 1868 of a shield designed by Henry Hugh Armstead and made by Hunt and Roskell in London in 1862. The original shield which has been on loan to the Museum since 1864 was made as a presentation piece for Lieutenant-General Sir James Outram, and commemorated his various military exploits in India. Electrotype copies were used as design aids for students in the government schools of design under the aegis of the Department of Science and Art. This original of this shield was a prime candidate for copying: it was one of the English productions that helped reverse the perceived decline in English design. The original was exhibited at the London International Exhibition of 1862, where it was one of the works that gained Armstead, a medal. It was shown again at the Paris Exhibition of 1867. The decorative treatment of the electrotype is a slightly simplified version of the original. The damascened borders on the original have been replicated on the electrotype but have been gilded as one. Electrotype copy of the Outram Shield, copper, silvered and oxydised and partly gilded, depicting in high relief in the centre Sir James Outram offering troops to General Havelock for the relief of Lucknow in 1857, and in low relief on the surrounding band other scenes from Outram's career from the defeat of the Bhils in 1822 to the relief of Lucknow. On the inner gilded band surrounding the high relief scene are portrait medallions of Indian generals who sided with British Imperial forces while on the outer band are facetted studs.
" PRESENTED TO LT GEN SIR JAMES OUTRAM BART GCB OF HM BOMBAY ARMY BY HIS FRIENDS AND ADMIRERS AND THEIR AFFECTIONATE REGARD AND APPRECIATION OF THOSE STERLING ABILITIES WHICH HAVE EVER MARKED HIS BRILLIANT CAREER SINCE 1818 AND IN LASTING TESTIMONY TO HIS GALLANTRY SELF DEVOTION AND HIGH CHIVALROUS BEARING DURING THE OPERATIONS ATTENDING ON AND FOLLOWING THE RELIEF OF LUCKNOW 1857"
This shield was bought by the Museum in 1868 from Messrs Franchi and Son of Clerkenwell, London for £55.0.0s. It is a replica of a shield designed by Henry Hugh Armstead and made by Hunt and Roskell in London in 1862. The original shield which has been on loan to the Museum since 1864 was made as a presentation piece for Lieutenant-General Sir James Outram, and commemorated his various military exploits in India. Electrotype copies were used as design aids for artists, artisans and students in the government schools of design which were run under the aegis of the Department of Science and Art. As an electrotype the shield is an example of a 19th-century design model. Electrotypes play a key role in helping us to understand the V&A in its earliest days. The Museum grew largely out of the Great Exhibition in 1851 and, under the guidance of Henry Cole, sought to arrest the perceived decline in British design. The Museum aimed, initially, to collect 'modern manufactures' for the education of manufacturers, designers and the public, with a long-term goal of improving the quality and quantity of Britain's manufactured goods. Cole was also in charge of the Government Schools of Design, which he set about reforming. Cole passionately believed in the potential of both museums and the schools of design, to raise standards of taste. Electrotypes were a by-product of the invention of electroplating (silver plating by electrolysis). ELECTROFORMING transferred the metal deposits directly into moulds in the plating vats. When enough metal had been deposited to create a self-supporting object, the mould was removed. Developed by Alexander Parkes, electroforms so accurately mirrored the moulds in which they were created that multiple copies could be created (ELECTROTYPES). During the electrotyping process a mould was taken of the original object. The moulds were made from gutta percha or plaster. Gutta percha was a tree-resin from Malaysia that could be melted and poured onto an object, but would set hard and take a perfect impression. During cooling it could also be manipulated. When the mould set, it was removed from the original object and then lined with graphite or plumbago to make it conductive. This mould was then immersed in the plating vats for coating with copper. Separate moulds were taken of various parts of the shield. In these, copper impressions were electroformed. These became 'type patterns'. The type patterns became the source for future moulds to be made to save going back to the original, which might be fragile or, in the case of objects in private or overseas collections, inaccessible. This shield then was electroformed in copper from moulds made from a type pattern which itself was electroformed in a mould of the original. The copper electrotype was then electroplated and electrogilded to look like the original. The final electrotype is therefore two stages removed from the original shield, but is still a highly accurate impression. Early experiments in electroplating, often by amateur scientists using Elkington's home electroplating kits, involved coating fruit, flowers and animals in silver or gold "with the most perfect accuracy". They "retained all the characteristics of the specimens before their immersion" (Penny Magazine, 1844). The Art Journal enthused in same year, "The electrotypes are perfect; the finest lines, the most minute dots are as faithfully copied as the boldest objections." Elkington's display of electrotypes at the 1867 Paris Exhibition proved extremely popular and prompted Cole to organise a convention at which 14 European countries agreed to exchange works of art. Representatives of Elkington's and the V&A sent staff to Germany, Sweden, France, Denmark and Hungary. The most ambitious trip, to Moscow and St. Petersburg in 1880, secured copies of over 200 items from the Kremlin and the Hermitage, including the celebrated Jerningham Wine Cooler and much Elizabethan and Stuart silver sent as ambassadorial gifts to the Tsars. By 1920 the V&A held over 2000 electrotypes. Copies toured the country as part of the museum's educational programmes and were sold to the public and to museums and art schools. Franchi operated a smaller factory than Elkingtons and were eventually taken over by the commercial giant from Birmingham who sold electrotypes for profit as well as instruction. A variety of finishes met a range of tastes and budgets. Electrotypes are also relics of 19th-century industrialisation and mass production. The process of electroplating and electrotyping favoured companies that could afford large factories and expensive technology. The power of the machinery and new technology now at the disposal of the silver industry encouraged modern mass production to develop. Electroplaters could create thousands of identical objects using a fraction of the amount of silver to create "a degree of mechanical finish it would be difficult to surpass" (Art Union, 1846). The focus of silver and silver product manufacture moved from London to the new factories of Birmingham and Sheffield. This combination of art education and mass production made electrotypes the perfect marriage of art and industry. Electrotype. From the C19th Register: "SHIELD, copper, silvered and oxydised and parcel gilt, "The Outram Shield." The original, of silver and steel damascened with gold, was presented to the late Sir James Outram, Bart., G.C.B., by friends in the Bombay presidency. In the centre is a group of equestrian figures in high relief, representing the voluntary cession by Sir J. Outram to General Havelock of the troops destined to relieve Lucknow during the Indian mutiny, around this a band damascened with gold containing medallion portraits in relief of distinguished Indian officers. A wider external band of groups of figures in low relief represents various events in Sir J. Outram's Indian career. 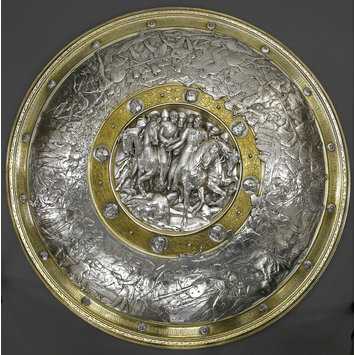 The shield, which is now the property of Sir F. B. Outram, Bart., was manufactured by Messrs. Hunt and Roskell from the designs of H. H. Armstead. Modern English. Diam 3 ft. 3 in. Messrs. Franchi and Son." This electrotype was made a year after the original Outram Shield was shown at the Universal Exhibition in Paris, in 1867. 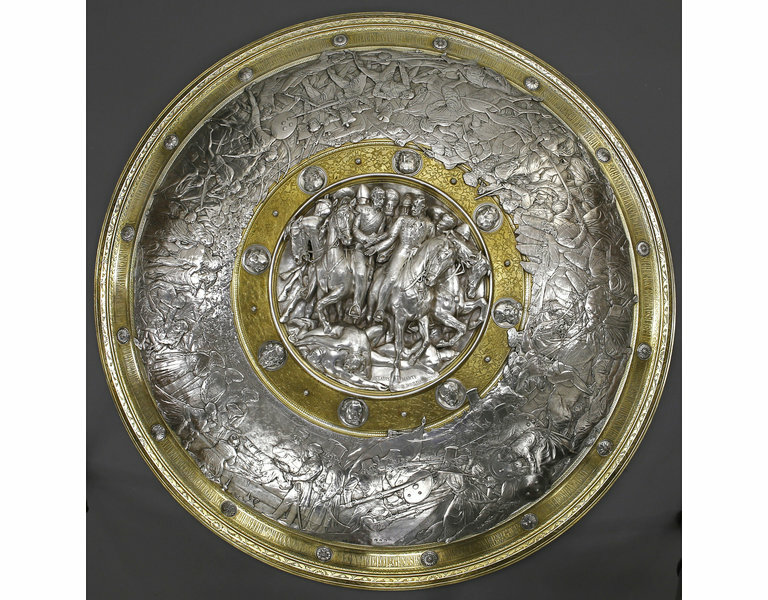 Designed by the sculptor Henry Hugh Armstead and first shown in London in 1862, the original shield was a product of mid 19th-century efforts to reform British design. Armstead trained at the London School of Design and the Royal Academy of Arts. The electrotype enabled successive generations of students to examine and learn from his work.